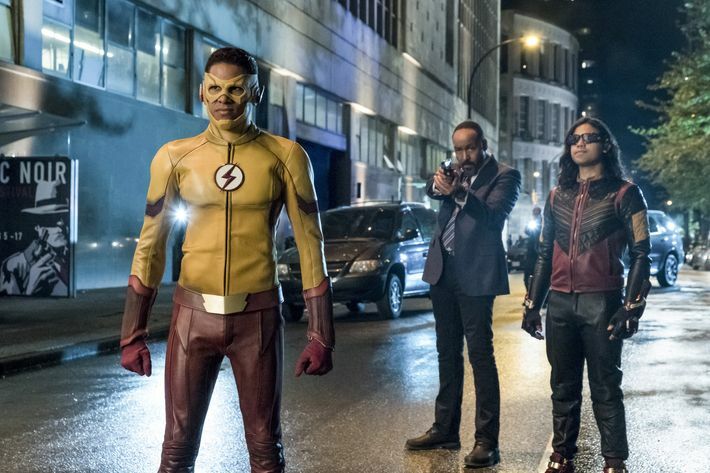 Wally West (Keiynan Lonsdale), Cisco Ramon (Carlos Valdes), and Joe West (Jesse L. Martin) are chasing a first season villain, Peek-a-Boo (Britne Oldford). Iris West (Candice Patton) is back at STAR Labs running ops. She tracks Peek-a-Boo’s movements, directing our boys on where she is and how to capture her. Peek-a-Boo nearly gets the drop on Kid Flash and Vibe, but luckily, for them, Joe takes her out before she can do anything to them. Cisco: “I hate teleporters.” Back at STAR Labs, Wally and Cisco return in a celebratory mood. Wally West: “Team Kid Flash is on the case!” Joe West: “Son, I love you. But ain’t nobody feeling Team Kid Flash.” Iris isn’t feeling it, one out of three criminals they pursue get away. She wants Wally to do some more training, making him miss family dinner. Iris goes home to an empty apartment. Something is creating a disturbance around the city. It is a flying Samurai. Team (whoever they are) confronts the Samurai. It wants the Flash; Kid Flash won’t do. Cisco and Wally aren’t too worried what the Samurai can do with only two swords, but the swords create a major shock wave. The Samurai promises to destroy the city in 24 hours if the Flash doesn’t appear. Cisco wants to bring Barry back from his Speed Force prison. Everyone is concerned that if the team takes Barry out of the Speed Force, the city will be destroyed. Cisco thinks he has a solution to this. Iris asks how long has Cisco been working on this, he answers since the night Barry left. He has talked to other geniuses in the Arrowverse and he’s ready to try. Iris is against it, she is worried what could happen, plus she isn’t sure if Barry is even alive. She shuts Cisco’s plan down. Cisco leaves and goes to a dive bar. The bartender is Caitlin Snow (Danielle Panabaker) dressed in biker chick chic. Cisco: “What is a nice girl with two doctorates and a Ph.D. doing at a rat’s nest like this one?” Caitlin asks how he found her, he brags about his access to satellites and other scientific means, but she correctly guesses that he vibed her. He asks her how she rid herself of Killer Frost, she doesn’t say, Caitlin just says she’s Caitlin that is good enough for him. Cisco asks Caitlin to help him get Barry back. He doesn’t have to beg, she quickly agrees. The next day Iris arrives to an empty lab. She senses that something is up. At the speed track where they first trained Barry as the Flash, Joe and Wally arrive. Cisco had called them. They are surprised to see Caitlin. She begs for forgiveness from Joe for what she did to him and Cecile, he gives her a big hug. Cisco tells Joe and Wally that he and Caitlin have worked all night on getting rid of the bugs in his plan to get Barry. He has the Speed Force Bazooka to open the Speed Force. Once he opens it, he will shoot a Quark Sphere in it that will mimic Barry’s signature so that the Speed Force won’t know he’s gone, preventing it from replacing Barry with another speedster or destroying the city. He shoots the Bazooka and opens the Speed Force, but Barry doesn’t appear. Iris drives up, and they believe they have failed. They haven’t though, in another part of town, liquid starts floating and the familiar speedster lighting appears. A red streak heads to the country and a naked Barry Allen (Grant Gustin) appears. Back at the lab, Iris and Cisco argue about his attempt to free Barry. He doesn’t understand why she is against this. Before they can continue arguing, Cecile calls Joe, the state police have picked up Barry. The Flash is in a hospital bed, when he wakes up, Barry does his version of the “Beautiful Mind”. He talks gibberish and writes symbols on the wall that does not make sense to anyone in the room. Cisco asks Caitlin what is wrong with him. She believes his words are out of order because of the Speed Force, or he developed dementia being in the Speed Force. They knock him out again and wake him up again to “Poker Face”, but his condition is the same. Iris talks to him alone, she tells him how she has been feeling since he left and asks, “Please come back to me. Please tell me you’re still my Barry.” They take Barry back to STAR Labs where he nearly destroys it before Caitlin uses the cold gun to stop him. The gang still must contend with the Samurai. When it reappears in the city, Wally dresses in Barry’s suit and tries to pretend he is OG Flash. When he and the Samurai begin to fight, the Samurai realizes this isn’t the Flash. The Samurai stabs Wally in the leg and tells him he wants the Flash by nightfall. Cisco is using an algorithm to figure out what Barry is saying. He thinks he has broken the code. His algorithm says Barry said, “This house is bitchin’.” Cisco confesses to Caitlin that he didn’t bring Barry back to save the city; he brought him back because he missed his friend. Joe and Iris talk alone. He confides to her that after thinking, she was going to die, and then Barry leaving, he needed something. Cecile suggested church. The priest said some words in his sermon that felt like they were for him. Joe: “Strength means nothing without faith. You’ve got strength, baby girl. You just need a little faith.” It is time to confront the Samurai so Joe leaves. Iris thinks about what her father said, looks at Barry, and says, “Come get me.” The police are confronting the Samurai. Iris walks pass them and tells the Samurai to take her because she has faith the Flash will come looking for her. The Samurai flies off with Iris. Joe rushes back to STAR Labs to tell Barry that Iris is in danger. Barry is talking gibberish but when Joe screams at Barry, “Iris is gonna die”; Barry speeds out of the room; taking the new suit Cisco had made for him. The team monitors the Flash and he is running faster than he ever has before. The Samurai leads Barry to a wind farm and they run amongst the combines in a cool chase and fight scene. Barry catches the Samurai, takes Iris and destroys it. It turns out the Samurai is a robot. It says to Barry, “Flash, welcome home.” Iris: “Barry…you came back to me.” Barry: “Always.” The two kiss. The Flash has been gone for six months, and even though his family and friends missed him, they kept protecting Central City in his absence. Iris took a leadership role with the team, and she did a good job keeping the group together. During this period, it appears that Caitlin or her alter ego, Killer Frost were working for a crime lord, and tending bar. She has rejoined the team, but I’m sure Team Flash will have to deal with her unsavory associates and with Killer Frost. It’ll be interesting to see how the writers will deal with the Killer Frost storyline. I don’t know what they did in the comics, not that they are obligated to follow it. My guess, Caitlin will be able to integrate Killer Frost in her personality and control it. Barry was full on “Beautiful Mind” when he got back from the Speed Force, but through the power of love, he is back to normal. His powers have increased since he has gotten back and he has gotten rid of the baggage that had been weighing him down the past two seasons. We have a happier Barry, which hopefully will mean we’ll have a happier fan base. The episode was good, it did exactly was it was intended to do. Get Barry back from the Speed Force, clear away the dour feeling the show developed last season and get us back to the more happy and carefree “The Flash” the audience fell in love with its first season. They have integrated Iris into the team Flash storylines, so maybe she will have more agency this season. Wally feels a little bit like the odd man out, do you need two Flashes on this show? I like the character and the actor so I hope they have some good storylines planned for him. The chase scene between the Flash and the robot Samurai was well done. I’m looking forward to the rest of the season.